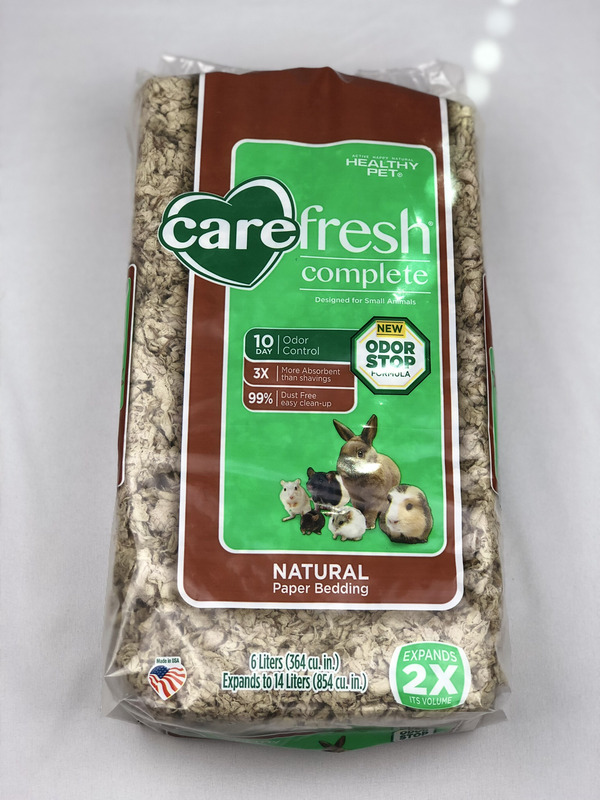 Carefresh Natural Small Pet Bedding provides superior odor control and absorbs three times more liquid than wood shavings to keep your small pet healthy and clean. It's made from natural reclaimed paper fiber, a renewable resource that's biodegradable and compostable. This high-performance bedding is virtually dust-free so both you and your pet can breathe easy. Carefresh uses a proprietary odor stop formula that has been proven to suppress overpowering ammonia odors for up to ten days, plus it won't fall apart or stick to the bottom of your pet's habitat as you clean. Made from comfyfluff—a natural reclaimed paper fiber that's biodegradable and compostable. Proven odor control formula suppresses overpowering ammonia odors for up to ten days. Dry bedding is comfortable bedding, which is why Carefresh works to be 2X more absorbent than wood shavings. Potential risk of impaction exists if pets ingest a significant amount of any type of bedding. If you suspect impaction, discontinue use immediately and seek veterinary care. When changing bedding types or brands, it is best to mix old and new bedding, changing over the course of 7-10 days.